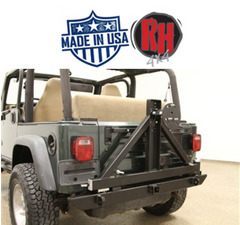 Rock Hard Jeep Rear Bumper/Tire-Carriers are made out of 3/16" x 2" x 4" thick tubing with ends that are boxed in. They have 2 sets of holes which mount to your Jeep frame in a standard position or can be raised 1" to increase departure angle and/or compensate for body lift. 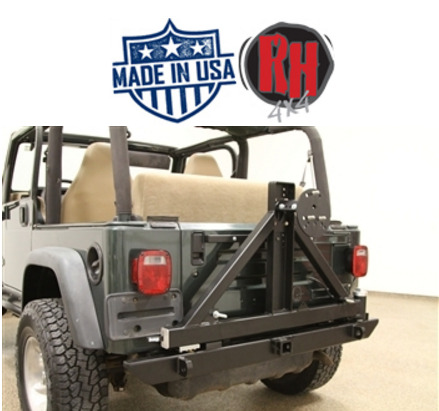 This bumper also comes with (2)-5/8" x 2-1/2" CNC D-Ring shackle mount with tabs that are welded on front and back. A standard 2" receiver .A CB antenna mount and horizontal Hi-Lift Jack mount comes standard. 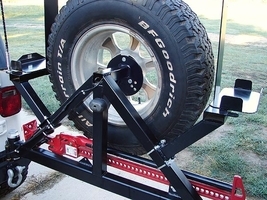 The swing out tire carrier will hold up to a 38" tire. All needed hardware is furnished for installation. We always recommend using �the Rockhard4x4 frame kit. DOES NOT INCLUDE RACK OR RIGHT & LEFT TANK MOUNTS! !